Polluted waterways, demineralized soil, galloping health epidemics of gastrointestinal disorders, food allergies, diabetes — and even cancer. Anti-Monsanto activists, including scientists, argue that these are just some of the horrors resulting from genetically modified foods (GMOs) and toxic pesticides, both produced by Monsanto. 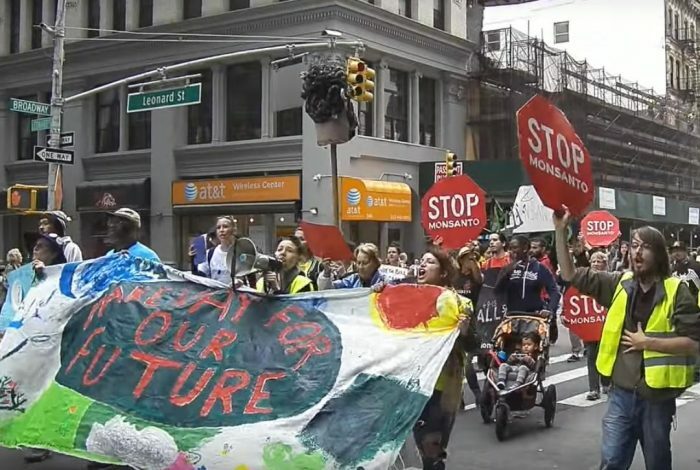 The March Against Monsanto held in downtown Manhattan on Saturday afternoon May 21st focused on the power that the agricultural behemoth wields over the world’s most important resource: Food. 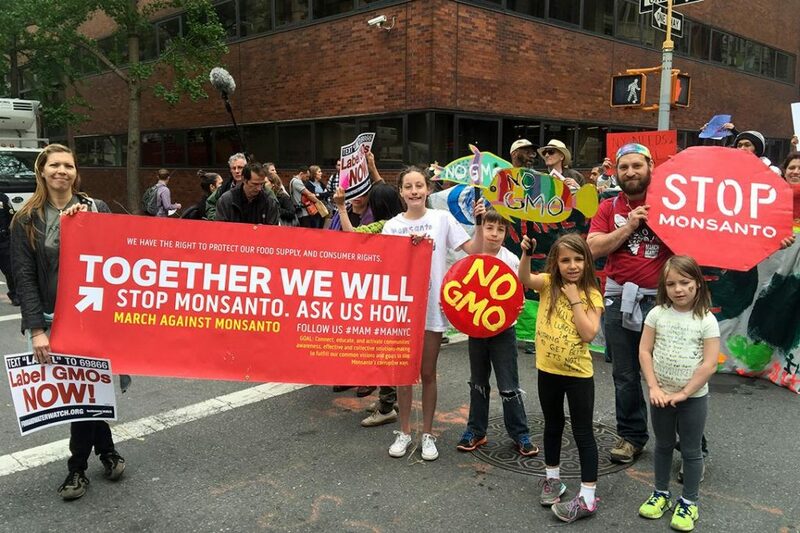 Some 300 protesters criticized the perceived vice-like grip Monsanto holds on the institutions — media and the government — that should be looking out for our interests. The demonstration was part of a campaign of marches across 300 cities and 48 countries. In the midst of the wave of protests, the intention of the German pharmaceutical giant Bayer AG to purchase Monsanto was widely reported. If the deal goes through, their combined might will represent a whopping 29 percent of the world’s seed market and 24 percent of the pesticide market. The demonstration was not the show of force some had hoped for. Documentarian Marie-Monique Robin — who made The World According To Monsanto — had flown in from Paris with a small crew to capture footage of the march. “Very few people here, too bad,” Robin said. She estimated that the march in Paris she attended in 2013 had drawn 3,000 to 4,000 people. That doesn’t mean however that there aren’t a great many people who feel strongly about fighting GMOs, Last year there was a $4 billion shift away from non-organic agriculture last year alone. This statement is supported by the interest March Against Monsanto galvanized on social media. But what was lacking in numbers was made up by the passion of the knowledgeable New York crowd. They spoke in unison about their efforts to avoid genetically modified foods and their anger at those in power who they believe frustrate that goal with their deep pockets and dirty tricks. What Are They So Riled Up About? 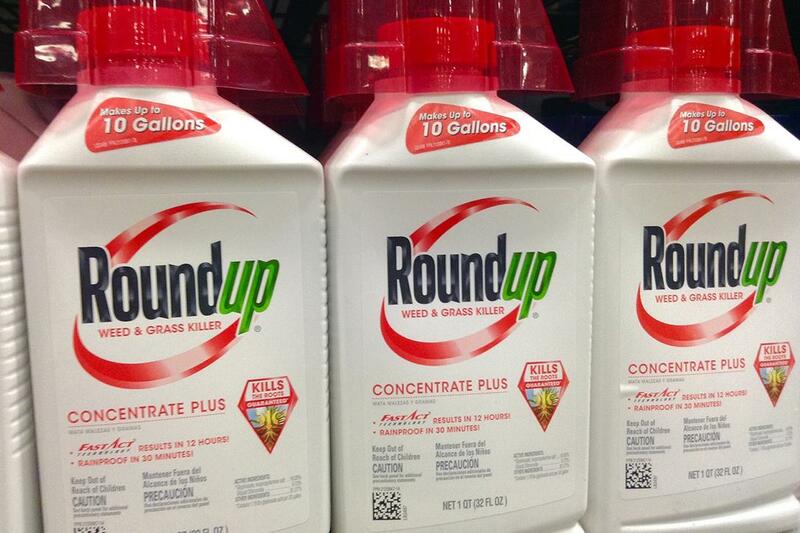 Monsanto modifies crops to resist the weed killer that it also produces: “Roundup.” This cunning strategy enables Monsanto to sell both seeds and, more lucratively, a patented pesticide to farmers in perpetuity. In the USA, GMOs routinely reach around 90% of national yields of soy, corn, cotton, canola and sugar beet. These are fed to animals and used in packaged foods, making GM foods nearly impossible to avoid. Hundreds of millions of pounds of the stuff (280 million in 2012) are sprayed across the country each year. The problem is, Roundup contains the chemical glyphosate, a highly toxic herbicide. According to the World Health Organization, glyphosate probably causes cancer in humans. Anthony Langer, a carpenter who had driven two hours from Middletown, NY with his wife and three children, told WhoWhatWhy he was marching against Monsanto because of glyphosate. The Langers were so concerned about it they switched to a strictly organic diet. “It’s absolutely more expensive. It costs me $200 more a month,” Langer said. It’s also time- consuming because there’s no Trader Joe’s or Whole Foods near his home. So, instead of a trip to one supermarket, the family has to go to “three or four different ones” to acquire ingredients his kids want in organic form. If Langer takes his kids off their non-GMO diet, he told WhoWhatWhy, within a week they’ll test positive for glyphosate in their urine. Marchers have reason to be suspicious. March facilitator Rachel Linden stressed a century-long history of deception concerning toxicity of it’s products. Recently, Monsanto had to drop much-touted claims that Roundup (glyphosate) was biodegradable when those claims turned out to be false. Monsanto’s deceptive industrial practices may have had deadly consequences. Over the last quarter century, Monsanto has paid out hundreds of millions of dollars to victims of practices ranging from PCB dumping in Alabama to the spraying of their infamous defoliant, Agent Orange, in Vietnam. Both of these actions have proven to cause high cancer rates and birth defects in multiple generations. Klein explains further that, by not reporting that GMOs have not increased yields, reduced pesticide use or made food more nutritious as promised, the media is running cover for the destructive agri-business. Ironically, the establishment media misses the flip side as well: it is competent organic farming that really accomplishes all those things. And when honest researchers raise their heads above the parapet to criticize Monsanto, its allies work overtime to suppress their word. Sometimes the suppression of facts about Monsanto can take a sinister form. In one case, when Dr. Andres Carrasco tried to speak about a study linking Roundup to birth defects in a small Argentinian town, physical intimidation was used to shut him up. Why The Fear of Labels? If nothing is wrong with GMOs, why hide their presence in a product? Why not label them? But Monsanto alone has spent $24 million fighting state labeling initiatives this year. Add resources from deep pocketed packaged food manufacturers and lobbyists like the Grocery Manufacturers Association and the resources aligned against the labeling movement are staggering. Currently 64 countries have laws mandating labeling GM foods. Of those, many, including the European Union, Russia, Japan and even China, ban them outright. But as Robin, the documentary filmmaker, said, even in countries with the ban, like her native France, the issue is complicated by the fact that while GMO crops aren’t grown domestically, they’re imported to feed the animals. With the exception of Vermont, which will start GM labeling in July, the US is the only developed country that doesn’t have such regulations. The desire to know what one’s eating goes far beyond the ken of activists. Since polling on the issue began in 2008, highly respected media organizations, including The New York Times and NPR have logged numbers showing that 90% or more of Americans want labels. To protesters, this disconnect is telltale evidence of a corrupt relationship between Monsanto and regulators. Perennial alternative mayoral contender, and long time anti-consumerism crusader, Bill Talen, also known as Reverend Billy, was in the middle of the pack, bullhorn in one hand. Asked if there is anyone in government who is not riding this agri-business gravy train he said: “Bernie Sanders.” Then he is gone — walking briskly with a Russia Today TV reporter waiting anxiously to get his take as well. References critical of Hillary Clinton’s Monsanto connections are repeatedly heard. Jonathan Vorchheimer, a slight man in a baseball cap, who volunteers for the Northeast Organic Farming Association is down from New Brunswick, NJ helping to man a large yellow banner that reads “Stop Monsanto!” His voice hoarse from chanting, Vorchheimer still summons great intensity in his denunciations of the cronyism protecting Monsanto. By 2:30 pm, the march had reached Foley Square and it was starting to rain. The crowd had suddenly thinned out to a couple dozen die-hards. But a mix of information and street theater was still to follow: Protest songs from rockers, “The Special Interest,” and speakers from some of the myriad of groups — Moms Against Monsanto, GM Watch, March Against Monsanto, Millions Against Monsanto, to name but a few. There was even a speech by a “Monsanto executive” — actually a man dressed in a comically large reptile head, fatigues and combat boots — who implied he had eaten an anti-Monsanto-activist named Maria. She added: “If you don’t believe me, ask Hillary Clinton, she knows all about Monsanto. I’m sure she’ll be sending them a Christmas card with big hearts on it, you know?” The small remaining demonstrators managed a long, loud laugh.